but I like this picture. A lot. It makes me happy. 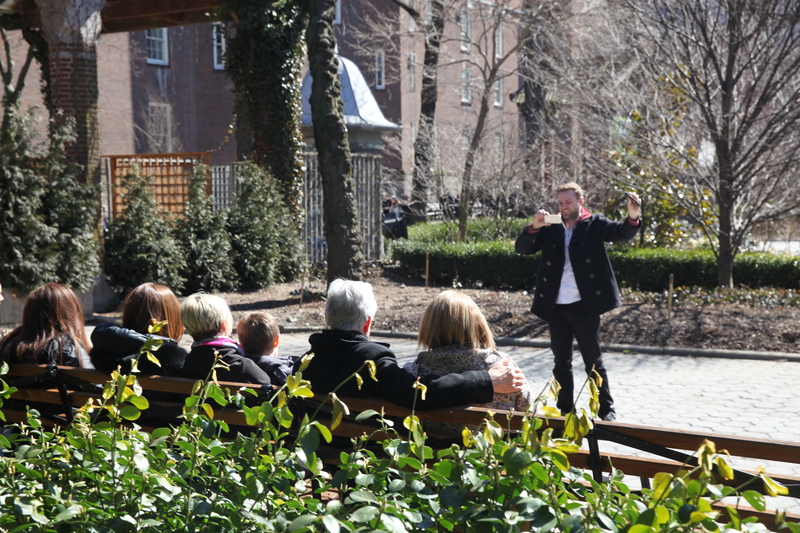 A man capturing his family group on the benches at Central Park Zoo. I’d just come out of the Penguins. To me, he looks like a conductor of an orchestra, feeling joy as he views the image of those whom he loves. It is fun to guess who the people on the bench are- a grandmother in the mix? This is a good place to begin the story. I quite like taking photos of people taking photos.. I wonder what they are seeing, what they think the photo will come out like – was it planned that way. I am all about capturing the moment. He captured the family and you captured him capturing the family. Excellent! I like that we don’t see the family’s faces, just the photographers and his apparent joy in the moment.